Giving up her vast education to minister to missionaries and the Chinese people, Lottie Moon educated Christians about the often preventable tragedies of missionary life while also teaching the Chinese about the Christian life. 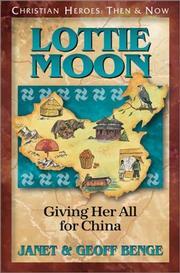 Lottie Moon: Giving Her All for China / Geoff Benge and Janet Benge. 520 Summary Etc. $a Summary, etc. note Giving up her vast education to minister to missionaries and the Chinese people, Lottie Moon educated Christians about the often preventable tragedies of missionary life while also teaching the Chinese about the Christian life.